Last week I made a poor decision on purchasing a pair of cute overpriced stockings. So I decided to take them back yesterday before Art and I made a day trip to IKEA to look for some shelves for my kitchen. 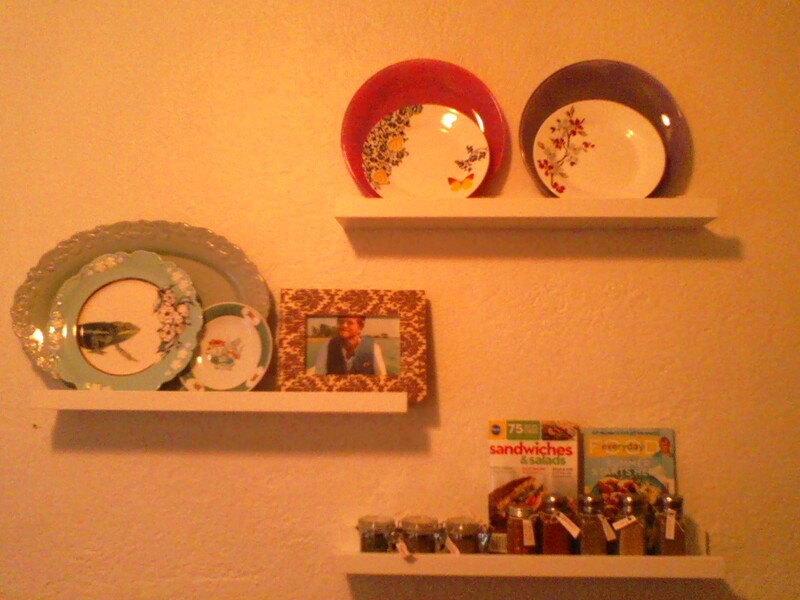 I ended up finding three floaty shelves for a good deal. It turns out that they were the exact cost of the overpriced stockings I took back that day. What a practical trade, I thought. To think that I could get three shelves out of one pair of stockings. What was I thinking? 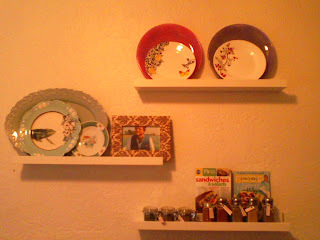 After working on hanging the shelves up this afternoon, I managed to finish and take a couple pictures for you to see. 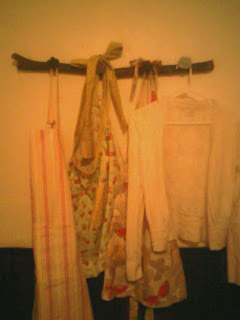 This is my little kitchen hanger I just made for my aprons. Don't mind the bad picture I took from my phone. It's really simple if you want to do it yourself. Just find a sturdy piece of wood and some cute cabinet knobs for the hangers and wa la. 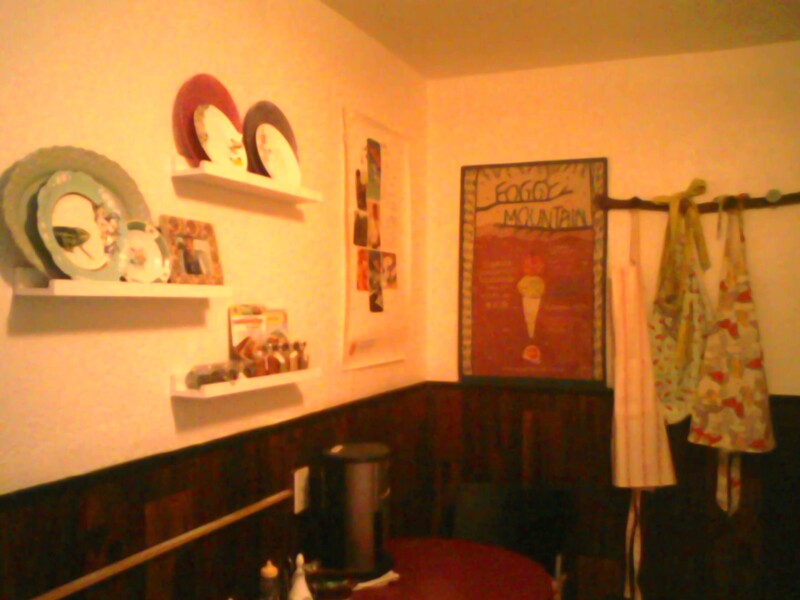 really not much to it, but a fun time filler to cover a part of my ugly kitchen wall. One of the things I've learned to love the most while being here in Columbus with Arthur are the nights we cook dinner together. I find that it's becoming more of a consistent pattern than when I first moved here while getting adjusted to life in Ohio. While preparing dinner together, Arthur pointed out the difference in our eating habits from the time I first moved here. For whatever reason, we went out to eat way more than we do now, which has changed considerably so within the past several months. Arthur picked me up from work after he had already finished class and work, so we were both pretty tired but hungry. So we threw a hearty salad together that turned out amazing! We both threw everything together while doing the dishes in about ten minutes. Team work. We put together our own little concoction of fresh spinach leaves from the market with grilled chicken and salty bits of bacon balanced with some thinly sliced apples we threw into the sauteed mix. Then we tossed in some diced plump tomatoes, crisp slices of uncooked apples along with just enough feta to give it a boost of cheese goodness and then sprinkled chopped almonds over the salad topped off with tart dried cranberries. For a last minute touch we finished it with a light dressing of vinegar and EVOO. YUM. This is such a good salad to remember when you don't feel like making an involved dish after a tiresome day. If you ever try it out, I hope you enjoy it as much as we did! This is my first apron I made last night at the lovely shoppe, Sew to Speak. I could spend hours in that shoppe just thinking about what I could do with all their beautiful fabrics. 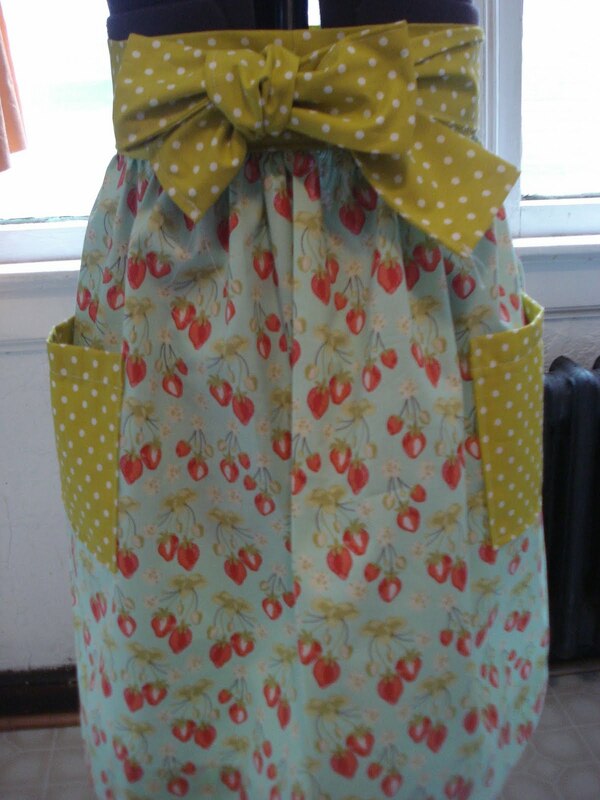 Time was running low while I was taking my sweet time trying to find a good match of materials for my apron, so I decided to go on ahead with the golden green polka dots for the pockets and belt of my apron and a cheery vintage strawberry pattern for the dress. It was a relaxing way to spend the cold night in the shop sewing with two other nice ladies. The next class will be over pattern layouts. I love it. Good friend, Stephen, accompanied Art and I for a home made dish the other night. We had an unplanned meeting at the grocery store for some last minute goods to complete our supper for the evening. Then we were all off to Art's apartment to start cooking. I'm so thankful for enjoyable nights like this. As we began preparing our meal, we relaxed to the smell of spiced salmon, savory brussel sprouts, home fries with a dash of rosemary, and fine conversation. This was the perfect time to step outside for a few moments just to walk back in to experience the comforting smell of a substantial meal, and so Stephen did just that. Then we finished with some warm brownies and jenis salty caramel and dark chocolate ice cream. yummy. We are looking forward to more nights of cooking with friend, Stephen! After Christmas, my sister and her husband came to Columbus to stay the night with me in my apartment. Arthur and I met up with them at Basil for dinner then took them around down town to give them a glimpse of Columbus, watched the end of the fire works show, and came back to my place and played some good ol board games. It was fun camping out in my apartment and waking up with good company & breakfast. I whipped up some french toast and eggs, while we sat and had some coffee. They stayed late into the evening and headed back up to Michigan. I loved that they came to see us to start off the new year! Before Christmas, I was fortunate enough to make it down to Florida for my nephew's first Birthday. It was a short stay but a meaningful one at that. Nephew won't remember how much fun he really did have with his Aunt, so I made sure we took lot's of pictures. Seeing my brother for the first time since his return from Iraq was so exciting, and I miss their little family so much. Since their not so far away from Disney, we spent nephew, Beck's, birthday at an Irish restaurant with river dancers and fun music. It was quite the celebration for such a little man. We also spent some time at a pottery shop, where we painted dishes for each other to keep. Seeing my brother as a father was so weird, but natural. He's such a good dad. He always took such good care of me as the youngest out of us three, so I have great confidence that Beck will be great for him. I was so proud, and I can't wait for the next trip down. Apologies for delving into past recent holiday events, but Arthur and I seemed to fall a little short of summary during the bustle of festivities. So here are just a few photos we took over Christmas. I hope you enjoy them. This Christmas was my first with Arthur's entire family, which was enjoyable for me to be apart of. Quite exciting, actually. The three day event consisted of celebrating a delicious Christmas Eve dinner at Art's Uncle Jim and Aunt Sherry's Bed & Breakfast followed by the opening of presents after putting the children to bed. Late into the night after the family finished opening presents one at a time, we all started food preparations together for the next day. I like being in the kitchen with enjoyable company while working together for an exciting dinner. There's always something good to look forward to in the end. Christmas Morning came early for the little ones in the house for their time to open stockings & presents. Then Uncle Jim got the tractor out and pulled them around with the sled attached. 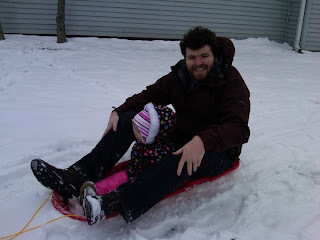 It was so much fun to watch while Arthur didn't hesitate for his turn on the sled with little Abbie. After we had our fun outside, we all came in to warm ourselves with an enormous lunch. Food coma set in with decaf coffee and conversation. It wasn't too much longer when it was time for Arthur's immediate family and I to head back to Mt. Vernon. The Following Sunday brought in more gifts to open with sticky buns that Landon woke up early to make. It was snowy and cold outside but warm and cozy inside with the smell of baked goods. It all ended on a satisfying note as we cooked a nice salmon dinner with couscous and salad, and Ellen, another family member, came to join us for dinner. After dinner, Hanna, Emilie, Art, and I went to spend some time with some good friends at their house. A perfect end to a relaxing evening and a pleasant Christmas weekend.